The 60s were a sensational, psychedelic decade. A lot happened in those 10 years: the Vietnam War, the Civil Rights Movement, the Cuban Missile Crisis, the first man on the moon… A lot of heroes rose up throughout the decade, from a passionate preacher named Martin Luther King, Jr. to a charming and idealistic president named John F. Kennedy. Nelson Mandela called for the end of Apartheid across Africa, while Neil Armstrong boldly went where no man had ever gone before. If you’re looking for someone from the 1960s to dress up like for your next costume party, you’ve got countless choices. 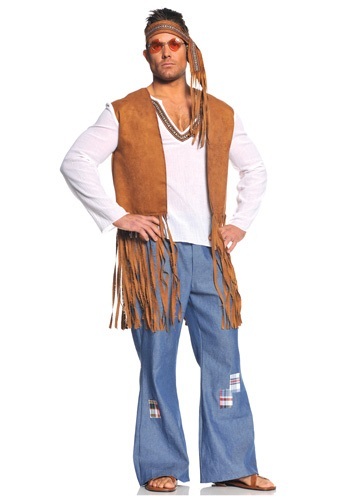 Or, you could just dress up like a hippie. While perhaps not up to the caliber of other famous 1960s figures, these countercultural rebels were the heroes of college kids everywhere who just wanted to have fun, broaden their horizons with different substances and share the love. Maybe old timers accused them of being purposeless stoners, but hippies knew the real meaning of life was to, like, just get along, man. Why nuke North Korea when you could chill out and listen to the Beatles together instead? Make love, not war! If you want to capture this free-spirited, nature-loving way of life, we’ve got the perfect costume for you: our Right On, Man! Hippie Costume. It includes a white V-neck long-sleeved shirt with an attached faux suede vest—with plenty of fringe, of course—and groovy bell-bottom jeans covered in fun, colorful patches. You’ll look totally far out!